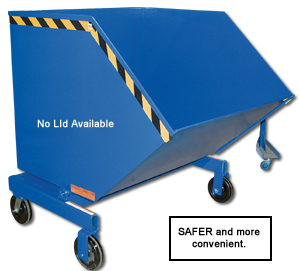 Makes handling waste and bulk material safer and more convenient. Fork truck entry tubes make dumping into large containers easy. Foot operated caster lock is included. Rolls on 8 x 2" phenolic wheels. Weight capacity is 2000 lbs. FOB Shipping Point. Product No. Cap. Cu. Yds. Size W x L x H Cap. (lbs.) Steel Gauge Weight (lbs.) Price Ea.